Welcome to yet another installment of Jalopnik Live, where we let you ask the newsmakers and stars of the automotive world the questions that you really want to hear the answers to. On this day 30 years ago, Richard Noble became the fastest man on earth. The world land speed record had been dominated by Americans and their fancy, cheap-as-dirt, military-surplus powerplants since the '60s. Noble turned the strategy around on them, took it back for the Brits, and kept it. Now he wants to take it up a notch. One thing's for sure, according to the Fédération Internationale de Motocyclisme and the Fédération Internationale de l'Automobile — sanctioning bodies for the world land-speed record — on October 4, 1983, Richard Noble piloted the Thrust 2 for a couple of passes on the Black Rock desert that averaged 633.468 mph. It didn't take a rocket, either. The team, led by Noble and engineer/aerodynamicist Ron Ayers, adapted a Rolls-Royce Avon engine out of an English Electric Lightning jet for the task. Not Since Donald Campbell had reached 403.10 mph with his Bluebird CN7 in 1964 had the Land Speed record been in British hands. That's where it would stay ever since, though a team of Americans and Canadians plan to try for 800 mph in a converted F4 Phantom. Noble and company would annihilate the Thrust 2's record in 1997, with RAF wing commander Andy Green at the controls of the ThrustSSC, whose dual Rolls-Royce Spey turbofans produced 110,000 hp. Green nailed 763.035 mph to simultaneously take the land speed record and become the first man to officially break the sound barrier on land. 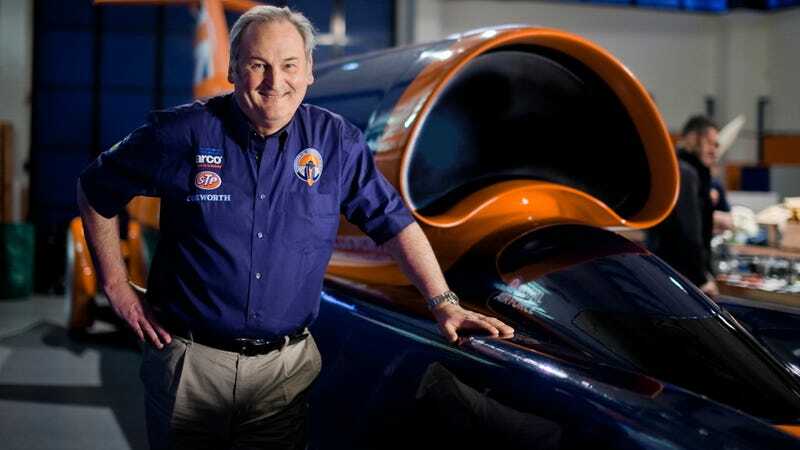 Now leading the Bloodhound Project, Noble wants to reach 1,000 mph with the Bloodhound SSC, again with Green at the helm, while opening the team's entire engineering process to the world. The hope is to get more students interested in the maths and sciences, and maybe to bring the world's attention back to the sport of maniacs and mad scientists, the World Land Speed Record. He'll be here from 1:30 pm until 2:30 pm (EST) to take your questions. Oh, and if you don't already, make sure to follow Mr. Noble and Bloodhound SSC on Twitter.